I met Sam Coskey and Avital Oliver on a Chinatown bus from New York to Boston. All three of us were taking the day to go visit Bob and Ellen Kaplan’s math circle in Cambridge, MA. Avital and I had independently read Out of the Labyrinth and were excited enough about it to contact the Kaplans and ask to visit. There I was, on the bus with two strangers, united by an interest in math education taking place outside the timeline and curricular demands of school. What was it like? Avital is not professionally an educator but he is as intense and passionate about math education as anyone I know. He and Sam met in the math department at Rutgers. I am a little vague on the details of the story but after Sam finished his PhD they were both in NYC and started up The School of Mathematics: Avital rented an artist studio in a basement in Fort Greene, Brooklyn, they outfitted it as a (very alt/boho-feeling) classroom, and started holding free math classes on Saturday mornings for all comers. As I described before, these sessions always start with a simple, usually elementary-level question. Then they go wherever the participants take them. Sam and Avital’s roles are felt more than seen: every time I’ve been present, the conversation has magically turned into a deep exploration of important content (why do triangles with congruent angles have proportional sides? how would you write down numbers if you forgot the usual way? why do parallelograms with equal base and height have equal area? why is multiplication associative? ), without being visibly directed almost at all. Anyway, on the bus, after hearing what they were up to, I found myself in an intense conversation with Avital about the nature of mathematics and the purpose of math education. I had spent the prior year and a half rediscovering my own relationship with math by working page-by-page and problem-by-problem through Michael Artin’s Algebra textbook (which is awesome, btw). I was having my mind completely blown by algebra and was really excited about it. I had also started to be certain that I wanted my professional life to be concerned with giving students the opportunity to have an experience akin to the experience I was having. I saw that experience as being defined by rigorous but creative play in an imaginative wonderland (the mathematical universe). I described this as my goal. Enticing students into this wonderland by setting them up to see some really intriguing patterns, images, and connections, was my plan to accomplish it. It’s not like I was converted on the spot – oh, never mind, yeah, I’ll forget my whole plan and start over. But it’s been deeply valuable to me over and over again to put to myself “Avital’s challenge”: say an idea is beautiful and I want you to see this. What question could we entertain that would make this idea necessary? And why would you want to answer this question? How could I get you interested in this question? And, if the notion of you being interested feels at all strained, maybe this is not the idea I should be leading you to. I think with that conversation Avital has won my personal “most influential conversation with a stranger on a bus” prize. Avital moved to Israel last summer, and Sam took over leading the School of Math, which he does really beautifully. Sam is leaving NYC as well at the end of this academic year. The future of the School is unclear. So, if you live in NYC, you might want to check it out before the end of May. Classes are on Saturdays and start at 11. This coming saturday, Avital is briefly back in town from Israel, so this might be a good one to be there for. School of Math workshops are always fun. They assume virtually no knowledge from the participants; they start with a simple question about some simple thing; and they uniformly turn into deep and rigorous arguments about fundamental questions. 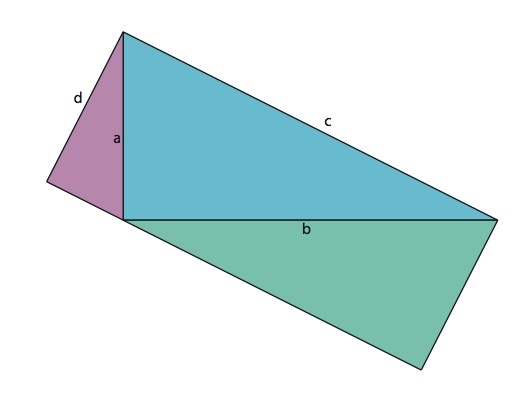 On this occasion we started with a simple question about perimeters and ended up proving that triangles with the same angles really do have proportional sides, and then using this result to prove the Pythagorean theorem. None of us was especially expecting this to happen. "It's like, you look at something, and you try to think what else it could be, in order to bring you closer to what it was in the first place." When was the last time you gave your students this opportunity? When will be the next time? Or I do say something like “Why should that have to be true? Can we come up with some kind of explanation?” But they have no idea how to even start and it feels unfair and scary to ask them to. (2): why does it feel scary and unfair to ask students (say, in 10th grade) to seek a justification? (a) Bob and Ellen Kaplan talk in their book Out of the Labyrinth about the need for a sense of relaxedness or leisureliness around time in order to run their math circles. Learning proof is the same thing. Creativity can’t be rushed. Any time I’ve successfully gotten an individual or a class to prove something at all difficult, without me intervening to suggest key ideas, the one constant has been that it took longer than expected and we had that time to give it. Every time, afterward I felt sure that the time was much better spent than it would have been any other way. But if in any way I feel a pressing need for the topic or question to get wrapped up, this makes it practically impossible for me to perceive and do what needs to be done to support the class in creating the proof without giving them too much help. It has to be okay for people to sit there stumped for a while and not make any progress. It has to be okay for people to take what I know is a wrong turn and find out it’s a wrong turn on their own. And I have to be listening to the conversation the right way – listening for the direction the ideas are taking, the obstacles coming up, and searching for the least obtrusive possible thing I could say to be helpful when they grind to a halt. If time pressure is also buzzing in my head I can’t listen that way. I’m now getting into touchy territory but because of my conviction that the most powerful math teaching I’ve ever done has been outside of time pressure, I’ve started to believe that we as a profession need to actively fight to keep our curriculum and standards not just unreasonably overloaded but actually kind of slim and when they’re not and we can’t do anything about it, to actively prioritize depth over coverage in the face of them. I have the luxury of not having a full-time classroom job anymore, so I recognize that my point of view about this is kind of facile. On the other hand, this year I have been working as a coach in a middle school/high school, and it’s clear to me in that context that everybody’s need to get through the whole curriculum is directly at odds with their desire to do something really substantive with any one of the many topics they have to cover. So I’ve been making the case that we need to choose what the most important topics are, and feel the license to: a) treat them very slowly, b) aim for the students to prove the main results, and c) take as long as that takes. I’ll illustrate one negative effect of time pressure with the second half of the story about my tutoring client I began to tell last time. Fresh on the heels of her triumph in creating and justifying an algorithm for factoring, I botched the next move, violating my own repeated advice to you. I was getting ready to go, but I was excited about her accomplishment, and I wanted to show her its power, and I also didn’t want her to be left with the impression that every monic quadratic can be factored over the integers. So I said something like, “You’re now in a position to prove that can’t be factored into linear factors. How?” She did it, but it took several minutes and I ended up leaving late. Most of the time was spent in a back-and-forth in which I repeatedly realized she wasn’t sure what I was going to consider as an answer to my question. Also, she first offered that it couldn’t be factored because 7 was prime, in spite of the fact that earlier she had factored at least one trinomial that had a prime constant term. (This is a classic case of what’s wrong with a “prove X” problem – by telling her it was unfactorable, I unplugged her from her own logical process to determine whether or not it was.) I feel totally sure that if I’d just said, “Factor ,” she would have taken the same few minutes realizing it was a trick question, and then she would have said, “you can’t do it.” And when I asked her how she knew, she would have provided a totally coherent proof on the spot, on her own. Now, why didn’t I just say this to begin with? Well, I was getting ready to go – I just had two or three minutes. In that context, the good pedagogical move – the trick question, asking her to factor the irreducible trinomial – didn’t feel fair. Of course, the actual time we were supposed to end wound up being irrelevant, because I stayed late to clean up the mess I’d made by being in a rush. So my sense of being in a hurry didn’t even get us done faster. The case at hand is Kate’s scenario – you’ve just had kids explore an object and you’ve succeeded in getting them to notice a pattern and make a conjecture about it; you’ve asked them if they can account for the pattern and they are stumped; and asking them to stick with this question feels unfair and scary. What is the unspoken agreement making it unfair? Okay this is where if you have ever been in this situation you write a comment. Reflecting now on past experiences of having this feeling, the common theme is that in one form or another, I’d promised them success if they do what I say. Over and over, I’d reassured them that “all you have to do is do the work and you’ll a) learn the content and b) get a good grade.” The way this promise played out day-to-day was a more immediate promise that if they actually applied themselves to any given task I assigned them, they’d conquer it. In this context, the thing that makes asking them to stick with the task of explaining the pattern they’ve observed feel both unfair and scary is that it violates my promise! The fact is that if the pattern has some subtlety, it’s conceivable that they’ll all sit there forever, apply themselves diligently, and never “in a zillion years” (to quote Kate) come up with a worthwhile explanation for it. Once this is clear, I have to ask what my reasons were for making this promise. Well, that’s simple. Every full-time classroom job I’ve had has been in an urban public school environment where it was quite hard to get the majority of students to do the work in the first place. Since getting them to do the work was obviously the first step in getting them to learn anything, it seemed totally logical to make this one act the sole key to success. How natural does it feel to take a student who’s got serious questions about the whole ‘school’ enterprise and say, “look, all you have to do is do the work and you’re golden”? Illustratively, the one class I taught in which it was not a struggle to get students to do the work was AP Calculus, and that was also the course where I felt the most license to give them a really bad*ss open-ended, maybe-nobody-will-get-it type of problem. (E.g., check it: let b take every value from 0 to 6, and draw each line segment in the first quadrant that connects (0,b) to (6-b,0). The union of these line segments is a region bounded by the axes and a very attractive curve. Find the area of this region.) Obviously the “AP” in the title gave me this license; but the truth is that this goes hand-in-hand with the fact that in that class, there was much less of a reason for me to communicate the message that all you have to do is the work. Anyway, retrospectively I think this contractual agreement (in all classes but AP Calc) cost me more than it bought me. It put a cap on the amount of creativity I could ask of my students, and ultimately, engaging with math creatively is what makes it rewarding. For example, it was hard to ask students to prove something subtle. I now believe that the tasks that I avoided because they felt unfair are actually central to kids achieving the type of learning I want for them. So what ended up happening was that I violated my promise anyway. Even if you did the work, it wasn’t a guarantee that you’d learn what I wanted you to learn. I think the issues I faced are pretty general, but my big point here is not the specifics of these issues, but just the question – if a task feels unfair, what is the unspoken agreement (the Contract) making it unfair? And is this contract worth it? *As Kate E says in the comments, Sam Shah describes in great detail an awesome occasion where he explicitly revised the contract he had with his calculus class, and then the new contract took effect, and the instruction felt powerful and new. Also, for those of you who like this sort of thing, two groups finished in what I considered too short a time, so I lied and told them I thought that there answer was too small. Now, they know I lie, but they also know that I know a lot, so they have become more used to responding, “we think we are done because….” which I consider a good thing. I don’t want them to stop because I say enough, but rather because the mathematics suggests that they have finished. This is why insisting on too much formality too early is bad for people who are learning how to prove… If someone is insisting on formality from you when you don’t have any reason to doubt something less carefully argued, you will get the idea that proof has nothing to do with what makes sense to you, what you find convincing. But you can’t produce a proof without being guided by this. All of this adds up to the case I’ve made before, that saying “prove that such-and-such is true” is the wrong problem… The “contract” that says we are supposed to give them a chance to work on “proof” as opposed to something else. If they also have to figure out what is even true, that could feel like we’re asking them to do more than just prove something. The problem is that they will never learn how to prove something if we don’t ask them for more. But I need some SERIOUS training in how exactly one goes about teaching that way. I wasn’t taught that way and none of my colleagues teaches that way. Sometimes I feel like I get close, because I make the kids investigate and measure and conjecture (today, for example: median of a trapezoid), but then I stop before asking them to prove it. Or I do say something like “Why should that have to be true? Can we come up with some kind of explanation?” But they have no idea how to even start and it feels unfair and scary to ask them to. It would not occur to them to draw a picture and extend the legs and think about similar triangles, in a zillion years. 1) Why don’t they know how to start? 2) Why does it feel unfair and scary to ask them to? These questions are bigger than me, but here are my 2 cents. I’m posting my thoughts on question (1) now because I wanted to get this up. I’ll post on question (2) tomorrow or Friday. I have 3 thoughts to offer about why they don’t know how to start. a) Inexperience on the students’ part. b) Failure of the question to hook into the natural processes students need to use to actually prove things. (a) A big reason they don’t know how to start is that in most cases, no one has asked them for this type of thing before (at least not with any follow-through – more in (c)). If they’re in high school, they’ve had a long time to formulate an idea of what is going to be asked of them in math class, and typically this isn’t it. The content for which they’re being asked to seek justification has 10 years of increases in sophistication since kindergarden, but most students’ development in terms of the creative act of seeking justification is still at the kindergarden level. The later the first occasion when the students are asked to find justification, the harder it will be for them. People who have been consistently made to justify their mathematical beliefs for a long time know how to start. I know this from private tutoring. If I have sufficient time with a kid, I have the luxury of requiring them to find a reason for every piece of content they learn in school. (I acknowledge readily that this is a luxury, and I only have it if the parents and student have made a sufficient investment of time in tutoring.) The task quickly ceases to be disorienting when it’s required every time they learn any fact. In a recent comment JD2718 wrote about the need to “play math” (meaning, in context, seeking explanations and counterexamples for patterns in numbers) well before a proof course. This is the same point. Seeking explanations and counterexamples is the main activity of research mathematicians. You can’t go from 0 to 60 on this practice; you have to start out slow and ease into it. Consequently I think it’s totally essential that justification infuse math learning from K on up. (As I said elsewhere, I think that the commutativity of multiplication should be treated as a major theorem needing a thoughtful proof.) This is going to require some major PD for elementary teachers; I actually would love to run some of this PD. Anyway, the fact that this is not the current state of the art adds up to big problems for high school teachers who try to do something more authentic and creative with proof after at least 9 years of schooling during which a typical student has never or hardly ever been asked to come up with a reason to back up their belief. (At least, not with follow-through – again, more in (c).) Why would it ever occur to them to extend the legs? Think about similar triangles? The act of coming up with a proof is essentially creative. You don’t just get creative on the spot in a domain in which you’ve never created before. (b) Another variable is the way the question is posed and the expectation for what will count as an answer. Especially when you’re first learning about proof, a request for justification has to hook into some natural processes in order for you to respond to it effectively. If you’re an experienced prover, you can hook a problem into these processes intentionally, but when you’re starting out, you can’t. The problem has to be posed just-so to make your natural processes connect to it. The question is most effective if it taps these processes. One way to do it: pose a problem – not a proof problem, just a figure-it-out problem – that the students don’t already know a process for, but that’s easy enough for them to find a solution. Then pose another problem that can be solved the same way. Then another one. Pretty soon the students have developed an algorithm. Now, the question “how do you know that works?” taps the “why do you think so?” process. The students do think so, for some sort of mathematical reasons, because they themselves devised the algorithm, in response to the original problem. They can come up with a good answer. I had a great time doing this very thing with a tutoring client two weeks ago. She’d just learned how to FOIL. I posed to her some simple factoring problems, such as . They were all reducible monic quadratics. She came up with one of the standard methods, totally on her own: “This really isn’t that hard. You just think of all the numbers that multiply to the last number, and you see which ones add to the middle number.” I asked her why that would work and she didn’t miss a beat, since the whole thing was her idea in the first place. She was a total Clever Hans when I started working with her two years ago. Yes, I’m proud of both of us. I botched the very next move, though – more in the forthcoming followup post. This conclusion would appeal to the intuition of just about every student I’ve taught. I’d probably have to prod them to even get them to test another example because they’d already be convinced. If I do get them to try another one, I’ll make sure the first one I ask about fits the pattern (say 10, or 25) – so they’ll be even more convinced. In that context, the first counterexample they come across is going to bother them. Then the “what (the hell) is going on here?” process is engaged. At any rate, these two processes, or the like, are needed to orient students as they try to prove things. I think a big part of why students flop when we ask them to justify is that the question fails to hook students into these processes. (c) One final thought about why they have a hard time proving: there’s a vicious cycle at work here. They already do have a hard time. That means we all know that if we try to get them to do it, it’s going to take a really long time, or they’re going to fail miserably, or both. In that context, it’s very hard to take this on. It’s even harder to follow through and really make sure it happens, and not to cop out in some way (for example, as in the article I wrote about last time). But this just exacerbates the situation I described in (a) above. Often the students in front of us are so inexperienced not because nobody has ever contemplated trying to get them to prove anything before but because many people have contemplated it and then opted not to, or tried it and then given up. Ultimately the task felt unfair in some way. This is the perfect segue into question (2), which I’ll engage in a followup post in the next day or two.